The year 2016 established new benchmarks for median home prices throughout the region. Most closings in neighborhoods now exceed their prior peak values set back in 2007. In fact, the Seattle Metro Area has become the fastest-growing housing market in the US, according to S&P/Case-Shiller Home Price Index. This imbalance of supply and demand is felt most near urban job centers. Major employers like Amazon, Google, Facebook and Apple are increasing their office space in downtown Seattle, luring thousands of new hires to live, work, and play in the city. With robust employment growth and mounting traffic congestion, demand for in-city lifestyles has never been higher and developers know it. Currently, 62 construction tower cranes are erected in Downtown Seattle, more than any other city in the US. The problem is, most of this supply is for rent and not available for home-ownership. This record level of construction is driving up development costs, rising more than 35-percent in the past five years on top of higher land values. Despite the added supply, both rents and median home prices continue to rise. 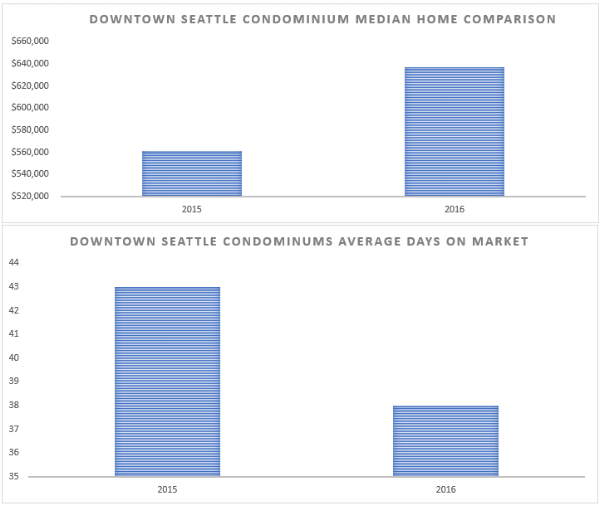 For perspective, since 2011 more than 12,000 new apartments have been delivered in downtown Seattle compared to only 865 new condominiums added over the past five years (only two of which remain unsold). This phenomenon has more to do with developer preference than consumer demand. High rents and low capitalization rates have made building apartments profitable without the risks of condominium development. That’s good for investors but leaves would-be buyers with few options in a market that’s already suffering from anemic supply of for sale housing. Rent growth has averaged more than 10-percent per year for the past four years with some buildings commanding lease payments of $4.00 to even $5.00 per square foot per month. It can actually be more expensive to rent than own, especially at price points below $600,000 where owners can purchase for as little as a 3-percent down payment while enjoying low interest rates and income tax deductions. These apartment towers are incubating thousands of future home buyers, many of which will explore purchasing after getting settled in their new job and choosing to lay roots. Condominiums are grossly under-supplied. According to NWMLS (Area #701), there were 934 condominiums sold in downtown Seattle in 2016, for an increase of 18.2-percent year-over-year. This includes the new construction deliveries of Insignia and LUMA. Meanwhile, as predicted, median home prices rose to $637,000, climbing 13.4-percent year-over-year. Days on market dropped from an average of 43 days in 2015 to 38 days in 2016. Even when removing the spike of new construction supply, the resale market still evidenced a rising tide of home values by 16.1-percent to $522,500 in downtown Seattle. Inventory will remain an issue. A scarcity of new construction condominiums will be surely felt in 2018 as there are no new high-rise condominiums set to deliver – a certainty because no projects broke ground in 2015 or 2016 for that matter. The only new high-rise condominium announced thus far is NEXUS, which is slated to break ground at 1200 Howell Street in February 2017 and will deliver 382 units by mid-2019. Not surprisingly, 80-percent of these homes have been placed under reservations for priority presale. The only other development for sale in downtown Seattle is Gridiron Condominiums which is currently under construction near Century Link Field in Pioneer Square. Reportedly, 35-percent of the 107 units in this boutique condominium are already sold with first occupancy scheduled for late fall 2017. Several other developments are rumored to be coming to market but none have been confirmed, none have broken ground, and unfortunately, their protracted construction schedules won’t deliver new units until late 2019 or 2020. A lack of supply is felt at all price points, especially below $500,000 where affordability is dwindling year-over-year. Conversely, the luxury sector has witnessed substantial increases. The top five sales in 2016 ranged from $3.2 million to $8 million with prices fetching between $1,039 to $1,633 per sq. ft. Realogics Sotheby’s International Realty was proud to have participated in each of these top five sales and continues to be a leading influence in the in-city housing market. Looking ahead in 2017, we’ll find continued strain on inventory with rising demand and increasing median home prices. Currently there are only 47 unsold condominiums in downtown Seattle listed for sale in the NWMLS. Just 3 homes are offered at prices below $500,000 and the balance is split evenly with 22 homes priced between $500,000 to $1 million and 22 homes offered above $1 million. The median asking price of this available inventory is $950,000. A downtown condominium has gone pending each day with 65-percent of this inventory finding a buyer in less than 10 days on the market. Illustrating continued increase in home values, the median home price of the 18 homes sold so far in January was $701,500. The top sale in 2017 is a resale of a new construction penthouse at Insignia for $3,125,000, which was at its full asking price and closed in just 15 days on the market. This home was previously sold for $2,782,000 in August, 2016, posting a 12.3-percent increase. Of the 16 resales at Insignia since first closing, the average value increased 18-percent. Information was obtained from sources deemed reliable but cannot be guaranteed. Readers should validate information from independent resources before acting upon data released in this report. E&OE. Warmly, Chinese Buyers "Survey the World Beyond the Seas"